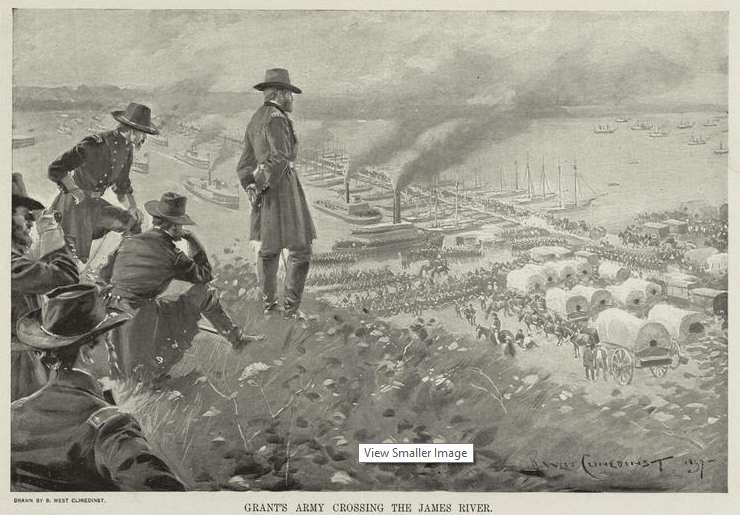 Grant’s operation to extricate his Union army from Cold Harbor and land suddenly in front of Petersburg in mid-June 1864 has often been described as a brilliant movement. Union engineers, regulars and volunteers both, worked rapidly to assemble the 2,170 foot pontoon bridge on June 14, 1864. The distance bridged, as far as I am able to determine, is the longest to be covered by a temporary span in modern military history. The rapid construction of this pontoon bridge allowed Grant’s Union army to rapidly shift operations south of the James River and threaten Petersburg from the east, just as Butler had on a smaller scale days before. Though the operation went largely unopposed by Lee’s Army of Northern Virginia, quick action by P. G. T. Beauregard, charged by Lee with the task of defending Bermuda Hundred and Petersburg, held off much larger numbers during the Second Battle of Petersburg, fought between June 15 and 18, 1864. I was able to find a nice online article from a U.S. military engineer magazine by Gustav J. Person about the engineer operations which erected the bridge if you’d like to read about that aspect of the crossing in more detail. Craig Swain also has some good information at To the Sound of the Guns in a two part series. See below for posts which refer to this operation at The Siege of Petersburg Online.